Cardinals love this bird feeder! 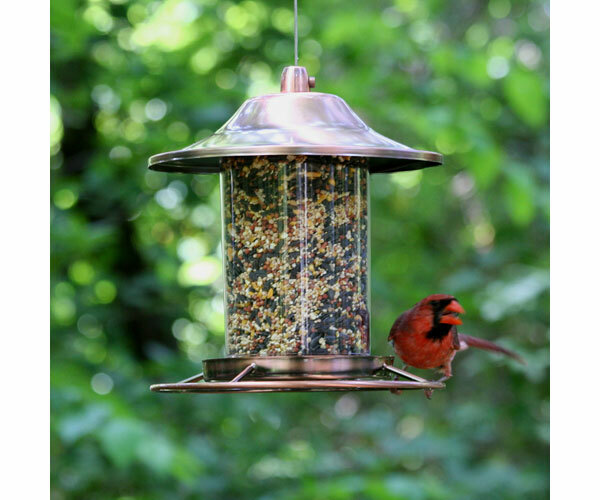 The Perky-Pet Copper Panorama Wild Bird Feeder is sure to attract many birds to your backyard. The cutting-edge design of this feeder allows the seed to dispense into the tray and stop dispensing once the tray is full. As the birds continue to dine from the circular perch, the seed is replenished into the tray so it remains consistently full. This feeder also features the Sure-Lock cap system, an innovative squirrel proof feature which ensures the lid stays put and squirrels can"t get into the seed. The Copper Panorama holds 2 lb of seed and features an eye-catching copper finish. Circular perch is loved by Cardinals!